This wedding cake was a last minute favour for somebody at work. Luckily though, I didn’t have to make the cake, just ice and decorate an 11″ square fruit. 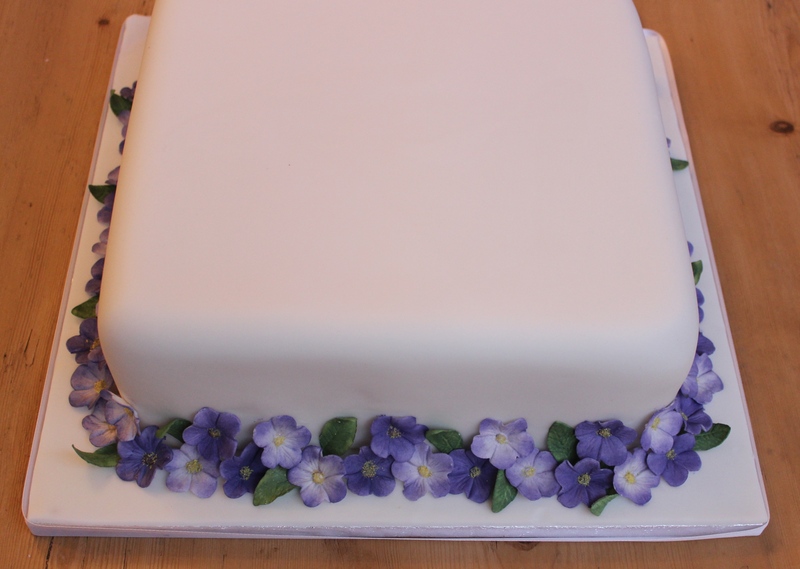 It was a single tier cake and I loved the simplicity of the design they chose I made around 80 flowers to go round the base, and only had a few spare at the end. This might sound like a lot but they were quick and easy to make so I managed to make them all (and the leaves) in a couple of hours one evening. To make them I used white sugar florist paste and cut them out using a 5 petal flower cutter and matching veiner. I left them to dry out in a foam petal former before dusting with purple petal dust. I made half of them purple all over and the other half graduated – I dusted the outside of the petals with more dust than the middles. 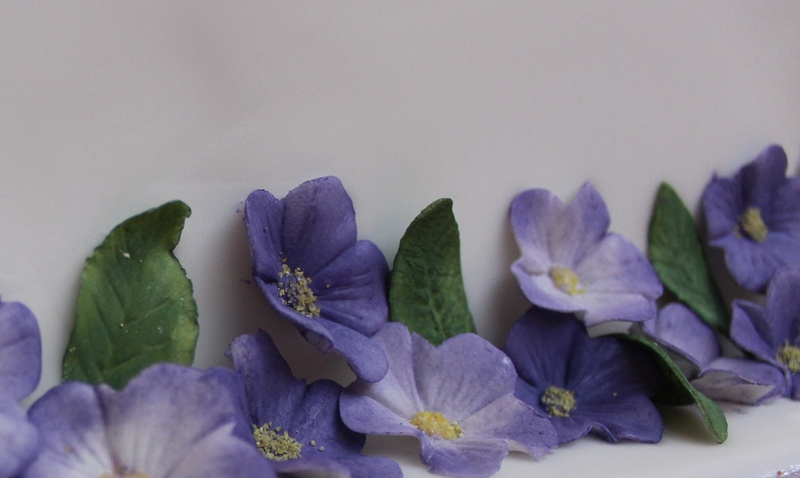 I then sprayed them all with an edible glaze (to set the petal dust – you can use steam but for lots of individual flowers edible glaze spray is much quicker). Once the glaze was dry, I used a paintbrush to put a dot of glue in the centre of each flower and then sprinkled some pollen dust onto it. I made the leaves in a similar way using sugar florist paste, a leaf cutter and veiner and some green petal dust. 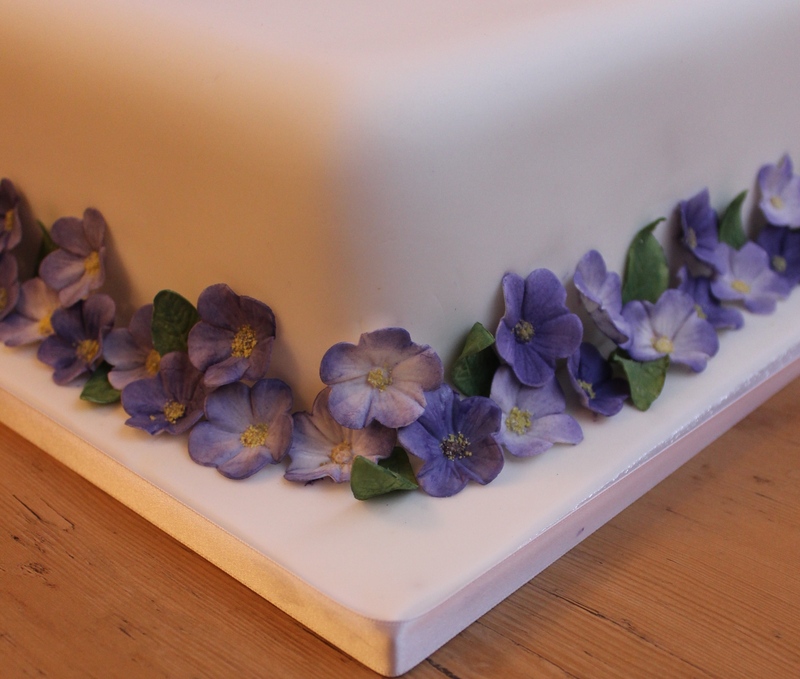 After I had covered the cake in marzipan and icing, I used edible glue to fix the flowers in place. I didn’t want them to look to organised but I put them on in groups of threes, with two on the bottom row and one above – I mixed up the dark and light flowers and placed the leaves whenever I thought one was needed. I really liked the overall effect – simple but with plenty of colour and texture.